A healthy dish that's full of plant protein, calcium and more. Please use all organic ingredients when possible. If you like to press your tofu, do this now. See notes for more instructions. I usually skip this step for this dish. In a large skillet over medium heat, add the garlic, onions and a couple of tablespoons of water or vegetable broth to keep them from sticking. Sauté for a couple of minutes until the onions start to turn translucent. Add the mushrooms and peppers. Sauté for another 3-4 minutes. Keep adding splashes of water or broth and stirring to make sure it doesn't stick. Then add in the greens, either spinach or kale, and stir until it starts to wilt, then turn the heat down to low. Dice the tofu or crumble it with your hand into the skillet. You want it to be very small pieces. I crumble it with my hand right into the skillet. Add all the seasonings on top and stir to combine everything well. Lastly, add the tomatoes and mix until everything is heated through. 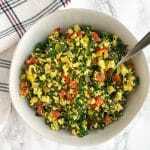 Serve the tofu scramble on it's own, in a wrap or even on a salad. Hot sauce, salsa or avocado are delicious toppings. Store in the refrigerator for up to three days in an airtight container. Optional: Press the tofu. Wrap the tofu in a couple of towels and place books or something heavy on it for 15-20 minutes to get the water out. I personally do not do this for this recipe as I found it works both ways.